Fermentable Oligosaccharides, Disaccharides and Monosaccharides and Polyols (FODMAPs). Irritable bowel syndrome is a common disorder that affects the large intestine, or colon, and causes abdominal pain, bloating, and diarrhea. This disorder is not life-threatening, but it can be uncomfortable, and it can interfere with the quality of your life and wreak havoc on your gastrointestinal tract. If you are an athlete, it can make it difficult to train. This syndrome is different from celiac disease, which is an immunologic condition. If exposed to small quantities of gluten, the immune system of someone with celiac disease reacts in full force. Like an allergy, it is a type of hypersensitivity reaction. Instead, intolerance to FODMAPs depends on the FODMAPs you consume. A small scoop of ice cream may be tolerated by your body, but a supersize milkshake could send you running to the bathroom. The same quantity-based effect is true of beans, lentils, and grains, which contain high quantities of hard-to-digest oligosaccharides. By understanding what the O, D, M, and P in FODMAPs stand for, Sarah was able to control her diet and eat foods that contain low amounts of each category. So let’s see what they stand for and how they helped Sarah cope with her condition. Then, later, we will discuss the F, for “fermentable,” which refers to what happens to the Os, Ds, Ms, and Ps if the small intestine does not provide enough of the enzymes to digest them. First, the O in FODMAPs stands for “oligosaccharides,” which are a type of carbohydrate. Carbohydrates form a large group of organic compounds that are present in foods and living tissues; they include sugars, starch, and cellulose. They contain hydrogen and oxygen in the same ratio as water (2:1) and are made up of monosaccharides, or simple sugars (Fig. 1), which are joined together to form chains containing thousands of these monosaccharide units. Oligosaccharides contain only between three and 10 monosaccharides, so they are relatively small. 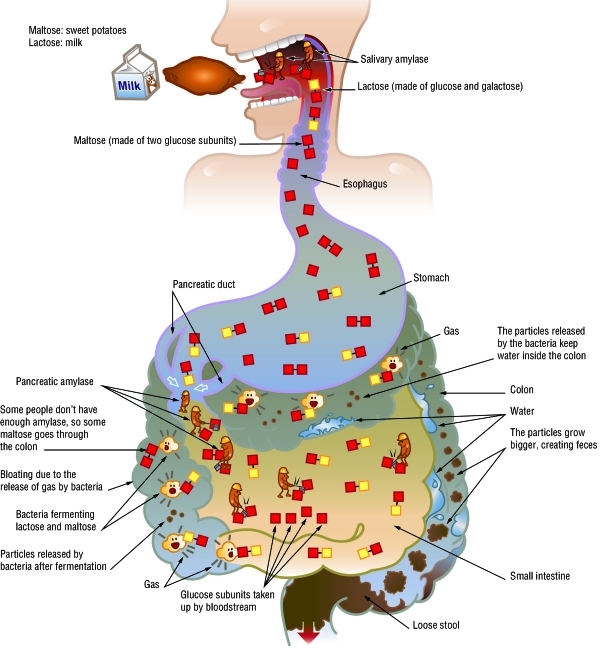 When food is digested, it goes from the mouth to the esophagus and then to the stomach and the small intestine. The main function of the small intestine is to absorb nutrients and minerals from food. Following absorption, nutrients travel through the bloodstream to organs and tissues throughout the body. The food parts that are not absorbed go through the colon, from which they are later eliminated. In the small intestine, biological catalysts called enzymes break apart the bonds connecting the various monosaccharide building blocks. For instance, pancreatic amylase breaks apart any oligosaccharides made from glucose into their glucose subunits. But certain oligosaccharides are built from other small sugars, and amylase won’t work on these. Two important examples are galacto-oligosaccharides and fructans. Galacto-oligosaccharides, which are made of galactose subunits (Fig. 2), are present in large quantities in beans, lentils, and chickpeas—the legume that is used to make hummus. Fructans are strands of fructose subunits, and they are found in several grains, especially wheat, rye, and barley, along with certain vegetables such as onions, artichokes, and leeks. Figure 2. Stachyose, a type of galacto-oligosaccharide found in green beans and soybeans, is composed of four monosaccharides that are in the following order (from top to bottom): two galactose molecules, one glucose molecule, and one fructose molecule. For the most part, humans can produce small amounts of the enzymes needed to break up galacto-oligosaccharides and fructans into their individual subunits (Fig. 3). Most people can handle modest amounts of grains and beans fairly well, but some people can tolerate large amounts, and some people cannot handle even a little bit. Also, any given person may handle galacto-oligosaccharides and fructans completely differently. Figure 3. A fructan molecule (blue) is broken down by enzymes (red) into fructose molecules, the building blocks of which they are made. There are several types of fructans, and their building blocks are either fructose or a mix of glucose and fructose molecules. Sarah loves hummus. She might be able to break down the galacto-oligosaccharides in hummus but not the fructans in the bread on which she spreads it, or it could be the other way around. In either case, any undigested oligosaccharides pass through the small intestine into the colon before being eliminated from the body. Upon reaching the colon, they will cause discomfort, such as bloating and diarrhea (Fig. 4). Figure 4. Schematic representation of the digestion process for three types of oligosaccharides: starch, fructans, and galacto-oligosaccharides, in the case of a person who has FODMAP intolerance. Now, let’s look at the D, or disaccharide, in FODMAPs. Disaccharides are carbohydrate molecules that contain only two monosaccharides. Like oligosaccharides, there are many kinds of disaccharides, and enzymes break down some but not others. Amylase, for instance, works well on a disaccharide called maltose, which consists of two glucose subunits, but it will not work on other disaccharides. Maltose is found in molasses and malted drinks, and it also accumulates in foods such as sweet potatoes when they are cooked. Heat breaks the bonds between glucose building blocks, but generally not all of them. So, often maltose disaccharides are left behind. Amylase is present in both saliva (which starts the digestion in the mouth) and secretions from the pancreas. If the quantity of starch is so high that not enough amylase is available to keep up with it, digestion may be incomplete. Any maltose and other disaccharides that are undigested after passing through the small intestine enter the colon and have a fate similar to that of oligosaccharides (Fig. 5). Figure 5. Schematic representation of the digestion process for two common types of disaccharides: lactose and maltose, in the case of a person who has FODMAP intolerance. One commonly undigested disaccharide is lactose, which consists of one glucose molecule and one galactose molecule. Lactose digestion requires an enzyme called lactase. Many people make a good supply of lactase, but at least 25% of adults are diagnosed as lactose intolerant, because their bodies do not make enough lactase. This condition is less common among young children, but often, people make less lactase as they grow up. After learning about this sensitivity to disaccharides, Sarah mentioned to her doctor that she always ate her cereal with milk and that she felt gassy an hour or so afterward. The same thing happened after eating ice cream or pizza. This meant that at least one component of her FODMAP intolerance was lactose intolerance. She would probably be better off avoiding the D portion of FODMAPs, her doctor explained, although she could take lactase enzyme in a pill form before eating dairy foods. Sarah tried using lactase enzyme pills, and it helped. But that did not mean that the Os, Ms, or Ps were not contributing to her condition, as well. In fact, because her stomach was upset, not just after eating cereal but also after eating pasta and other grains, the doctor suspected that she did not tolerate fructans well. How about the M, or monosaccharides? Although most people have no problem absorbing common monosaccharides such as glucose, some people do not absorb other monosaccharides found in food. A typical example is fructose, which we can obtain from sucrose, or granulated sugar, or from fruits, such as apples or some processed foods, especially those that contain high-fructose corn syrup. The last type of compound in FODMAPs is P, or polyols. These compounds, also called sugar alcohols, have the general formula (HOCH2[CH(OH)]nCH2OH). Three common examples of polyols are sorbitol, mannitol, and xylitol, which are added to foods, mints, and chewing gum because they taste sweet. But sorbitol, mannitol, and xylitol are not absorbed into the bloodstream and, like undigested oligosaccharides, disaccharides, and monosaccharides, they pass from the small intestine to the colon before being eliminated. So what is the problem? Don’t these carbohydrates and polyols just get eliminated? The problem lies in the F in FODMAPS, the letter that we have not yet discussed. It stands for “fermentable,” which refers to the fermentation process, and this is what causes all the trouble. You may have heard of fermentation in connection with yeast. Yeast performs fermentation to produce energy by converting sugar into alcohol and carbon dioxide. Fermentation turns fruit juices into wine and grain mash into beer or whiskey. The carbon dioxide produced by fermentation makes the bubbles in beer and some kinds of wine, and causes bread to rise. This is one type of fermentation, but the term actually applies to a variety of similar chemical reactions. In addition to accumulating gases, polyols, monosaccharides, disaccharides, and small undigested remnants of oligosaccharides cause what is called an osmotic effect. Like salt, these compounds draw water from the other side of the cells that surround the hollow part of the colon. As a result, the stool stays more watery than it would be otherwise. All of this produces bloating, gas, diarrhea, and pain—all of the symptoms that Sarah experienced and which prompted her to seek medical help. People who are sensitive to FODMAPs have noticed various levels of improvement when they eliminate another ingredient from their diet: gluten. Why is that so, given that only people who have celiac disease are known to be sensitive to gluten? The reason is that foods contain different compounds. Intolerance to grain-based foods, such as bread and pasta, is not because they contain gluten but because they also contain FODMAPs. FODMAP intolerance is not an allergy. Unlike gluten sensitivity, FODMAP intolerance is not an immune reaction. Instead, the condition is an intolerance to certain types of food. This food intolerance is due to bacteria in the colon that ferment carbohydrates and to the presence of too much water in the large intestine, leading to diarrhea. Many factors can influence how people react to foods, and this is the case with Sarah. She seems to have a lactose intolerance and probably also an oligosaccharide intolerance, but the good news is that the condition can be controlled. Taking pills with the enzyme lactase before eating dairy products solved part of the problem, and Sarah can also try enzyme pills that help break down galacto-oligosaccharides when she eats beans, lentils, and other legumes. In the meantime, Sarah has reduced, but not eliminated, her intake of grains—full elimination is not necessary for people with FODMAP intolerance, because the intolerance is based on the quantity consumed. At the same time, Sarah has increased her intake of rice, because it does not contain significant amounts of fructans but still contains starch, which Sarah can use to generate energy when she exercises. By taking a more moderate approach, Sarah began to feel a lot better, and by the next season, she ranked nationally in high school track and field. So if you, your friends, or your relatives have symptoms similar to Sarah’s, get ready for a new food craze—the low-FODMAP diet. David Warmflash, M.D., is a science writer who lives in Portland, OR.